A move to paddock grazing can boost both grass and livestock performance, according to Shetland farmer Jamie Leslie. Mr Leslie farms 865 acres in partnership with his father John at Scholland, Virkie. He says his land is the opposite to most of Shetland, which is peat and heather, as it is light and sandy, merging with sand dunes along the coast. “The biggest problem we have is salt spray from the sea, which burns the grass and can really affect production,” said Mr Leslie. He says a move to finishing cattle on a paddock-grazing system has paid dividends. The family runs a herd of 75 commercial Aberdeen Angus suckler cows, put to an Angus bull. Cattle are fed a store ration during their first winter, to keep costs down, but last year when they were turned out to good quality grass, they achieved a daily live weight gain of 1.83kg per day from the end of April until mid-June. 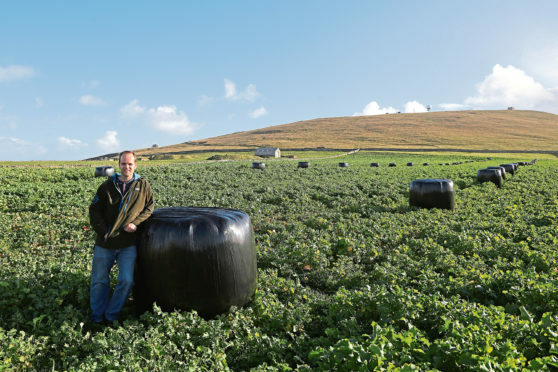 “In one block, stocking density has increased by 50% and growth rates by 40% from 0.97kg/day to 1.35kg/day, simply by putting some hot wires up,” said Mr Leslie, who is also chairman of the Shetland Monitor Farm management group. Changes have also been made to the family’s sheep flock, which comprises 850 Shetland-cross-Cheviot and Texel-cross ewes, and 200 followers, which are mainly put to the tup as ewe lambs. “Up until this year we bought in ewe lambs, put them to the Texel and kept the progeny, which then went to Suffolk rams,” said Mr Leslie. He said he hoped the move towards Highlander genetics would enable him to produce a ewe of about the right size which will scan at the required 170% plus and boost the percentage of lambs reared and sold per ewe. To monitor the effectiveness of his paddock grazing regime, Mr Leslie regularly weighs and records lambs and calves. Grass sampling has also shown improved grass quality as a result of rotational grazing. Permanent grass samples taken in September showed rotational paddocks with an ME (metabolizable energy) of 11.3 and crude protein of 20.8, compared to the set-stocked area which had an ME of 10.4 and crude protein of 15.1. “The performance of the 2017 lamb crop was compromised in paddocks by making them tidy up too much grass, so in 2018 we used a leader–follower system, with ewes and twins leading and suckler cows and calves following,” said Mr Leslie. In future, he plans to utilise fodder beet, which was sown for the first time last year, to graze 300-400 ewes from early to mid-pregnancy, in a bid to free up some deferred grazing for mature cows and keep them outside longer, before coming in for calving at the beginning of March. Mr Leslie is also trying a new wintering system for his in-calf heifers, which this year will be strip-grazed on a field of Italian Ryegrass, where he has already set out round bales of undersown wrapped straw, which he said analyses similar to good hay. A lamb weaning trial carried out last year, whereby lambs were weaned in July and paddock-grazed on first- and second-year grass, will also be rolled out to the whole flock.